You know, people tend to focus on Michael Myers's unrestrained violence when they talk about his career. We get it, that's what the movies tend to focus on. But just think about his epic ambition for a minute. The devotion he shows to utterly destroying his family's legacy simply because his sister preferred having some private time with her boyfriend rather than trick-or-treating with the neighborhood kids is impressive in a weird way if you think of it. Yes, violence is never good but having enough angry ardor to last through more than five hit movies is pretty stunning. Unfortunately for all of us fans, we'll never know how he fuels his get-up-and-go attitude. No one who's ever set out to interview has come back at all, much less with enough dialogue for a real tell-all story. All we can do is step into this man's shoes for Halloween night and hope that some of that gusto, some of that zeal rubs off into our day-to-day. 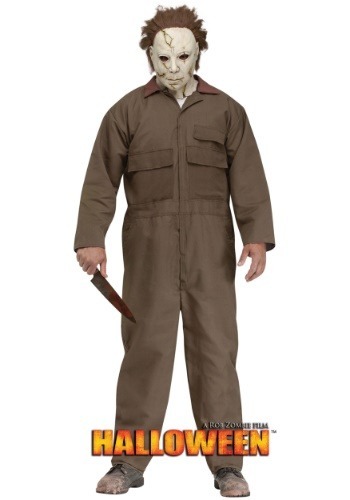 This officially licensed costume is instantly recognizable to horror fans born in the last century, as this legacy has been popular for a healthy forty years. It features the classic jumpsuit that everyone knows and fears with pocket details throughout the front and secures up the front with hook and loop strips to make changing into the classic horror villain a breeze. The look is topped off by the mask with its facial scars and the attached scruffy brown hair. If you want to go the whole mile (we know Michael would) find one of our knife props to make your look complete. So, if you're ready to step into the large and eerie shoes of Michael Myers then you're probably about to have a classic Halloween. Go out solo or head out with a couple other classic horror movie villains. Just remember to live with ambition, just like the determined Michael Myers!